Isobel Cooper best known as ‘Izzy’ was still a student at the Guildhall School of Music and Drama when she signed her first record deal with Decca Records in 1999. She recorded her debut album ‘Libera Me’ with the London Symphony Orchestra at Abbey Road Studios. ‘Libera Me’ made No.1 in both the UK and Japanese Classical Charts and led Izzy to be nominated for ‘Best Female Artist’ in the Classical Brit Awards. She pioneered the classics in a fresh and innovative way, working with producer Craig Leon who has also worked with Pavarotti, Andreas Scholl, Joshua Bell, Blondie, The Ramones, Sting and many others. After the success of ‘Libera Me’ Izzy signed to Virgin’s Venture Label to record her second album ‘Ascolta’. Once again, her album climbed to No.1 and Izzy became an International Star with top 10 albums in Scandinavia and Portugal as well as repeating her No.1 position in the UK and the Far East where she achieved her biggest following performing in live concerts, TV and radio. She was then invited to sing at the Rugby League Cup Final at Twickenham in 2001 to an audience of 78,000. Her third album ‘New Dawn’ was recorded in 2002, again reaching No.1 in the UK and other foreign territories. One of the most fascinating aspects of Izzy’s work is her modernization and interpretation of Classic English Folk Music. Her video of ‘My Love is Like a Red Red Rose’ remains one of the most played videos on UK Classic FM TV Radio to this day. As a result of Izzy’s overall success, her music has now been embraced as a new force in the ‘Healing Music’ market for its spiritual and relaxing qualities. At this stage of Izzy’s career, she worked with other known artists such as Sir Cliff Richard, Lionel Richie, Charlotte Church, Hayley Westera, Russel Watson, Jemelia, Gareth Gates, Hear Say, Blue, Billie Piper to name a few, and after hearing ‘New Dawn’ Bryan Ferry invited Izzy as his support act for his Stately Homes Tour where she proved to be an immediate success. The USA released a compilation of the second and third albums entitled ‘Izzy’ and Izzy was invited to perform at the Crystal Cathedral in Los Angeles for a network TV Transmission with a 20 million anticipated audience. She sang several solo numbers and teamed up with U.S Chart Topping Tenor Daniel Rodriguez. Their duet ‘The Prayer’ is also featured on both their albums. Izzy made her third appearance at the Royal Albert Hall in 2003 when she was part of a special BBC television series ‘Songs of Praise’ hosted by Aled Jones. She also makes regular appearances in the ITV Christmas Eve Specials with other British Classical Artists. At the beginning of 2004, Izzy performed at the opening ceremony of Expo in Nagoya/Japan. Based on her success she returned the following year, where her voice and music complimented the theme which was based on ‘Arts, Culture and World Peace’. Over the course of her three album releases, Izzy’s work has been heard by additional millions of listeners as the synch music for many World Wide released feature films and adverts. One of which provided the theme music ‘Wish’ for the worldwide hit video game ‘Rygar’ and the classic aria ‘Una Furtiva Lagrima’ played in the acclaimed film ‘It’s all about love’ featuring Clare Danes and Jaquin Phoenix. As well as recording albums, Izzy has always had a special love for teaching singing and has had a number of very talented private students over the years. In 2005, Izzy moved to Spain and opened her first ‘Rock School Academy’ for the younger generation and in 2006 her Rock School joined Izzy in performing for the ‘Moraira Festival’. Following this, Izzy then started to direct and perform in a number of shows on the Costa Blanca including the highly successful ‘Simply Classical’ in 2007 and ‘Viva La Classica’ in 2008. These intimately staged musical events dedicated to Pavarotti, truly celebrated his life in style and created a magical atmosphere which captivated the audience. In contrast to Izzy’s classical albums, a musical album was launched at the beginning of 2007 entitled ‘Izzy Sings Musicals’. At the same time, Izzy embarked on new adventures touring in new foreign territories and exploring new audiences for her music. Her travels took her to South America, South Africa, Mexico, Hawaii, South East Asia, USA and the Mediterranean. Izzy concluded the year singing as a featured headline guest entertainer on the Maiden Voyage of Cunard’s Queen Victoria. Due to high demand and live concerts worldwide, in 2010 Izzy gained great inspiration living in Spain and released a Classical guitar/vocal album entitled ‘Cancion’ accompanied by Robin Hill. In recent years, new horizons have opened for Izzy, she has once again collaborated with Craig Leon for the production of a number of projects including a guest appearance filming in a music project called ‘Quest Beyond the Stars’ filmed by PBS and in association with NASA. In 2011, Izzy moved back to the United Kingdom and became a proud mother of a beautiful young girl called Sophia April. Now, Izzy continues to perform and teaches privately in the comfort of her own home. Izzy offers; private tuition, vocal workshops and her ‘Rock School Academy’ to a number of schools in her community, including Musical Theatre and Special Needs Schools. Izzy’s love of music therapy and the power it holds in healing young children inspires her to want to help and put back into the community. 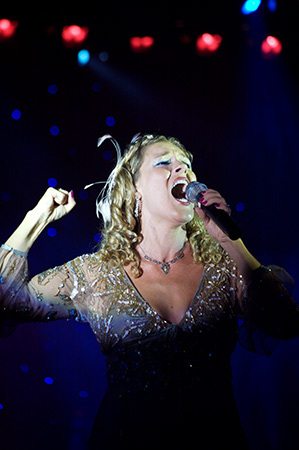 She sings at numerous fund raisers and continues to support the Royal Variety Club of Great Britain.